For many people the idea of speaking in public fills them with fear and prevents them from being able to enjoy the challenge. It's hardly surprising as many business people don't have to perform in public too often and it is unnerving to know that if you make a mistake it's going to be witnessed by many people. This can be exacerbated with a business speech as the audience is likely to be composed of people from your company or from other companies in your market sector who you will meet again. So it is understandable that many people find public speaking difficult. There are various sources of help if you feel that your fear of public speaking is preventing you from giving effective business speeches. The ones that you choose to use will depend on the nature of the problem, its severity and your learning style. Dealing with that last point first, people tend to have a number of different learning styles and different theories categorise them in different ways. Essentially what this means is that some people learn best in classroom situations or one-to-one training while others prefer learning from books or other self-paced training materials. These days, the latter category increasingly includes internet-based learning, using computer-based training, video, audio or a combination of all three. One-to-one or classroom style training is available commercially or informally. There are trainers who will come in and help business people develop the skills and techniques that they need to become confident in public speaking. 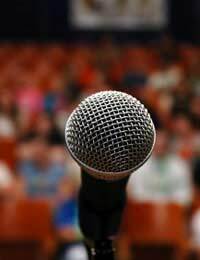 A good course will cover techniques for public speaking itself as well as those for coping with the stress and fear associated with giving a business speech. A company may well pay for a trainer to come in and give classes for public speaking, and perhaps other public-facing situations such as radio and television interviews. Equally they may also pay for one-to-one training although this is obviously more expensive. It might be considered necessary for a senior executive who might be embarrassed at revealing perceived weaknesses in front of other members of staff. If a company is less prepared to pay for training and you feel that the problem does need some outside help, you could of course pay for commercial one-to-one training yourself. The other option is to look for groups or courses available in your area. There are groups of business speakers or toastmasters in most areas and although there are likely to be subscriptions to pay they won’t be as expensive as paying for a commercial trainer out of your own pocket. Adult education courses delivered by local authorities or local educational establishments such as colleges or universities might well suit. Although courses specifically for business speaking might not be held in your area, there are likely to be course on other aspects of personal development which will deal with the fear of speaking, albeit perhaps in an oblique way. If there are courses on assertiveness and self-confidence, for example, they could well tackle underlying issues and make delivering a business speech less of an ordeal. In this article we’ve focused more on delivered courses than self-paced training - which is not to say that books, video or audio training can’t help. It is more that, regardless of your learning style, it is highly likely that practice and feedback from other people will be highly effective and that’s hard to get from a book or online training. But there’s nothing to stop you having a go at that first. It may well get you a long way down the road and work well enough for you to deliver effective business speeches. You could perhaps practise in front of a video camera and then review your own performances to see what works and what doesn’t. Whichever training method you plump for, once you have begun to work successfully on your fear of public speaking, take a look at our article in this section on developing poise and confidence.